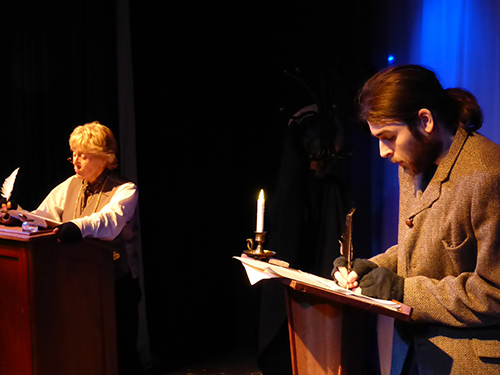 Among the many who came to see A Christmas Carol, the more keen-eyed of you may have noticed that I was playing the role of Bob Crachit. This is a little bit of a departure from my usual zone of comfort, namely, being the one behind the audience, in a dark box, hidden entirely from view. Not the one standing on stage with a few kilowatts of light pointed at me. But this raises an important question – if I was on stage, who was in the box, controlling all the techinical malarkies? Well, I was. You see, all good technicians are able to be in two places at once. Or, at least, they give that impression. In truth, it was more complicated than that. Shall I explain in unneccessary detail? I think I shall. We have a thing called an ETC Element. It is a large silver box with a button on it that says “GO”. I went on a course a couple of years ago to learn how to use it. Turns out, you have to press the “GO” button. This silver box is our lighting board. It is, in effect, a fancy lightswitch. We also have another silver box with the Apple logo on it. But that’s not important. What is important is that it has a rather nifty piece of software on it called QLab. It too features a large button with the word “GO” on it. From this laptop we control all the other technical aspects of the show. If you were to follow the mass of cables coming out of this laptop then, well, in truth you would very quickly get lost and confused and start weeping quietly to yourself. I know I do. However, if you were to persevere you would find that there are three key routes to follow. The first will take you, fairly straightforawdly, to a pair of projectors. The second route will take you, rather less straightforwardly, to the speakers on stage. The third route will take you to a radio reciever, and this lets me listen to Gardner’s Question Time. No, not really. The radio reciever is in fact tuned to pick up the radio microphones that we were using to make the ghosts sound, well, less ordinary. And cunningly plumbing it into QLab in this way allows me to turn the channels on and off with the click of a button, thus removing the need for actors to be relied upon. I really oughtn’t poke fun at the actors, since I’m one of them. But then, old habits die hard. So, that is how Qlab lets us control most of the technical elements of a show. But not the lights. So, we had to find a way to get these two silver boxes to talk to each other. Easier said than done – computers are notoriously antisocial. They never seem to have much interest in what each other have to say. But then conversations conducted in binary numbers usually are. Except it doesn’t have to be done in binary numbers. It could be done in hexadecimal numbers. And that makes all the difference. Hexadecimal numbers (numbers written in Base 16, if you’re interested, which I realise you’re not) are usually used for electronic music or something like that, but someone clever has reappropriated them to do other things. One of these things is to get one silver box to send a signal to another silver box to tell it to press “GO”. So – plug the laptop into the lighting board with a special cable and hey-presto! We have all the technical stuff being controlled from one place. But you still need someone there to press at least one of the “GO” buttons, even if only so that “GO” button can tell the other “GO” button to press itself. So, how do we get around that issue, considering that the person who needs to do this will be on the other side of the room, and not available to clamber over the audience every few minutes. Well, sat opposite me as I write this is Mr. Naylor. He is typing at his computer using a wireless keyboard. A keyboard which, for the duration of A Christmas Carol, may have been borrowed by a certain technician. 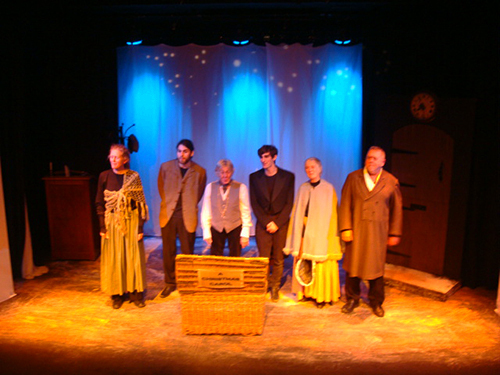 Were you to watch A Christmas Carol from backstage you would have seen a somewhat frantic cast attempting to quickly, sliently and in the dark (a challenging combination) move set around, change costumes and get from one side of the stage to the other without bumping into each other. You would also have seen a rather nervous looking Merlyn clutching the afforementioned wireless keyboard (a raggedly placed bit of electrical tape highlighting the relevant key), hoping against hope that when I press a button, things will magically happen. And it did. Without fail. Well, it did fail during the final dress rehearsal, and I had to grovel apologetically for a while. But then, that’s what rehearsals are for. And speaking of rehearsals, on Thursday the cast of our upcoming Waiting for Godot will be gathering for a first read-through. I am among their number, and am very excited to be on stage again. That’s at the end of March. And it just so happens that tickets are on sale. Maybe you’d fancy clicking here?